If you can find a spot in their busy reservation calendar (I recommend calling), Nobu is a don’t-miss dining experience during Restaurant Week. My previous Nobu experience was in Las Vegas (with a couple of my favorite SinglePlatformers), where we put ourselves in the chef’s hands and let him design a choice menu for us based on a couple of preferences and a desire for adventurous eating. I now know I don’t like sea urchin. Accompanied by my boyfriend and my brother, our trio took a similar approach to Nobu Next Door’s NYC Restaurant Week menu, ordering each combination of the three prix fixe meal options and eating them family-style. Standing at over six feet tall, the boys brought similarly tall appetites, so we supplemented the three-course meals with two additional cold dishes. The special menu appetizers featured some of Nobu’s fan favorites. The rock shrimp tempura was crunchy, a little spicy and cooked perfectly. The squid pasta isn’t pasta at all – simply squid in a pasta-like shape, asparagus and mushrooms in a tangy sauce with a kick. The boys fought over the last bites of it, so if you like heat, this is the dish for you. I preferred the sashimi over salad: fresh, rich-red tuna over greens in a light dressing. 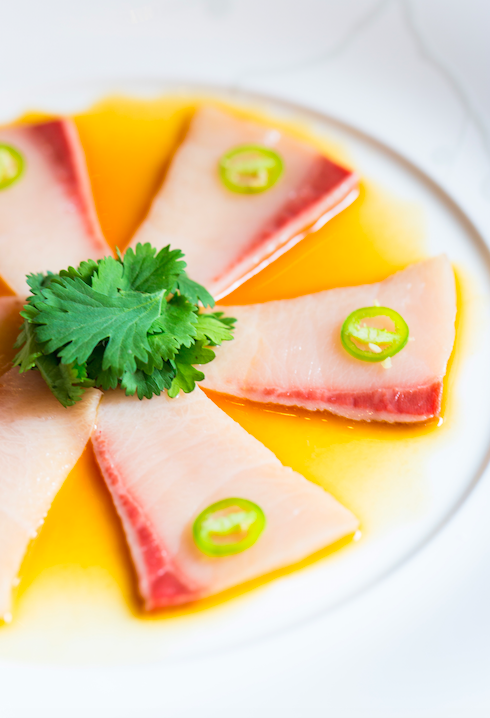 Off the Restaurant Week menu, the first cold dish we ordered was the yellowtail with jalapeno. It came in a light citrusy reduction, beautifully presented and flavorful. We also shared the crispy rice: squares of fried rice “tater tots” (as my brother put it) and a dish of traditional spicy tuna sashimi. Total crowd-pleaser; even the seven-year-olds next to us loved these treats on toothpicks. The sushi entrée was the biggest of the main course options, featuring six various pieces of fish (tuna, yellowtail, crab, and snapper to name a few) and a tuna roll. All fresh, all tasty. The cooked dishes were done perfectly. Their signature Black Cod with Miso is an absolute must. The servers push it for a reason; it melts in your mouth and its sweetness is even more appreciated in this smaller serving. Our strip loin steak dish was a tender medium-rare, and we opted for the spicier of the two seasonings, which was a little overpowering. The teriyaki may have been a better option. They sent out two panna cottas with pistachios, a fruit glaze and coconut. The coconut was overpowering, and the overall texture was a little too reminiscent of Jell-o. 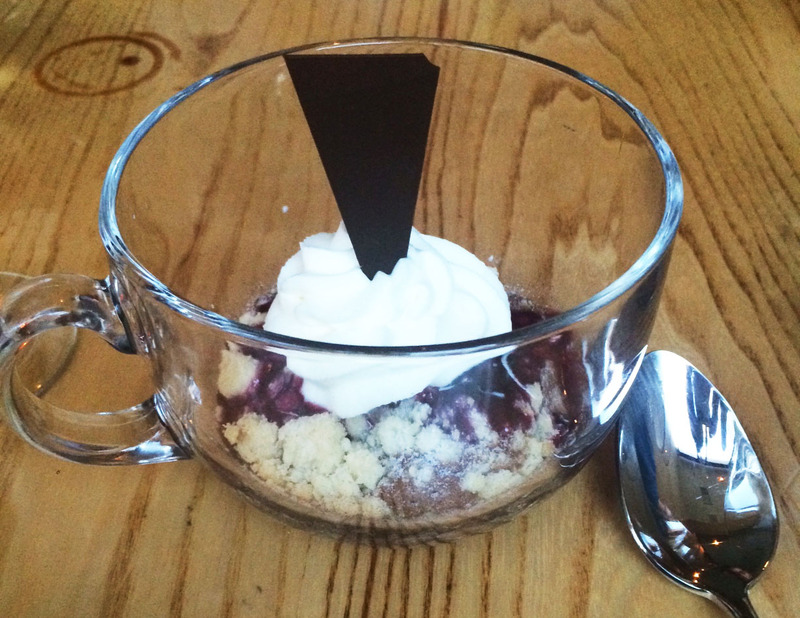 The other dessert was described as chocolate-based, but was more of a crumble with a blueberry topping and lemon-flavored whipped cream. Anything that tastes mostly of butter covered in fruit and cream-based sugar is okay by me, but it wasn’t anything special. The drink special price breaks were significant compared to their regular wine and cocktail list, and although we were all tempted by the special tequila-based cocktail, we opted for beer and wine. The featured rosé was crisp, and the Sapporos cold. The service was excellent, and the atmosphere surprisingly casual. We were seated a little too close to our neighbors (those seven-year-olds I mentioned earlier were playing loudly on an iPad throughout dinner), but aside from that, the experience was wonderful!